Not too many years ago the shaving soap landscape, particularly in the U.S., was arid: there were a few high-quality, old-school, tallow-based (more on that below) shave soaps from the established high-end names (Trumper, Taylor, Truefitt, Harris, etc. ); and some low-end, every-man soaps like Williams Mug Soap, Burma-Shave Soap, and (a little later) Van Der Hagen. And virtually nothing in between. Oh sure, you could find a hardy artisan toiling away in their kitchen if you knew where to find them. But they were few and far between (one notable “old-timer,” Emsplace, is still around, having stayed in business largely by word of mouth). Now that arid landscape has become a lake, with products covering an entire range of price, performance, and scent. And the lake has a surprisingly stable depth, without much of a deep end or a shallows. A lot of shave soaps perform solidly, if not exceptionally! But I think one side of the lake is a dam, and the lake level is getting awfully close to the top of it…and it’s showing a few cracks as well. Those cracks are the “supply” side of the “supply and demand” economic equation (wow, I sure am mixing my metaphors, aren’t I? )–there may be now too many artisans to support the demand of the shaving soap consumer. I think the next year or so will tell the tale. But let’s look at this “embarrassment of riches” while we can to try to determine which shave soaps are merely really good and which are truly great. When discussing soap, especially shave soap, a lot of terms get thrown around: hot process, glycerin, tallow, triple-milled, etc. But what do they really mean? And is one ingredient or process inherently superior to another? Let’s look at a general overview. Hot process soaps are made by using an external heat source to (carefully) speed up the soap-making process (“saponification”). Hot process soaps generally take less time to make: a couple hours for saponification and about a week to cure. Extra ingredients are added near the end of the “cook time” and the texture of the soap is generally rough-looking. Cold process soaps may also be made with a heat source but it’s used to liquefy solidified oils for mixing. The real saponification comes from an exothermic heat reaction between the fatty acids of the oils and and a lye (“base”) they’re mixed with. Cold process soaps take about a day to “cook” and take several weeks to cure. Extra ingredients are added early on and the soap’s texture has a smoother look. You may also see the terms melt and pour or glycerin. The term “melt and pour” defines the soap base as a ready-to-use item as opposed to someone saponifying fats and oils themselves: in effect, the most difficult and time-consuming aspects of the process are already complete. Some artisans then add additional ingredients and/or fragrances. Most of the time the prepared bases are made in large production facilities using specialized equipment. You may also see it referred to as a glycerin soap. This is a misnomer however for all shave soaps contain glycerin–it’s a by-product of saponification. Glycerin is a by product of saponification but it is not typically the main base ingredient in a non-tallow based shaving soap. The main ingredient in vegetable based soaps is most likely Stearic Acid which can be derived from various vegetable sources including Palm Oil, Kokum Butter, Mango Butter, and Cocoa Butter. Stearic acid, when combined with Potassium Hydroxide makes lather. This is why Tallow, and other high stearic fats are commonly used in shaving soap formulas. Most of the time there is a combination of ingredients used as there are many different kinds of triglycerides that provide various benefits in shaving soap. It’s important to make a soap that has great lather but it’s also important that the soap is moisturizing, creamy, bubbly, slick, and protective. Tallow was used back in the day as a source of stearic acid. It was a super cheap by-product of the meat industry. You may have heard the term “tripled milled” (or perhaps “French milled”). These are soaps that have been passed between large steel rollers, squeezing more air and water out of the soap (and it also provides some additional mixing of the soap, making it more uniform). Because more air and water have been removed, triple milled soaps are denser and last longer than un-milled soap. In my opinion, none of these processes or ingredients are inherently better for a shaving soap. I think a great shaving soap comes from using quality ingredients, mixed in the correct proportions. Despite “conventional wisdom” there are tallow-based shave soaps that are nowhere near “best” (*cough*WilliamsMugSoap*cough*). There are vegetable-based soaps that are excellent. And vice-versa. While “melt and pour” soaps sometimes get knocked because they are thought of as short-cuts, there are examples that are very good. So what are the “best” shaving soaps? To be sure, there are many excellent shave soaps, mostly from artisans making products in small batches with quality ingredients. Unfortunately artisans come-and-go, they often have limited availability, and their formulations tend to change more often. So let me propose a set of criteria for determining what rises to the top. This criteria is a bit different than my other “best” lists. I had previously listed “Availability” as a much higher criterion. My thinking at the time was that if an artisan’s product was available at more than one outlet–say, Amazon or West Coast Shaving–that it would be an indicator of the stability and viability of the artisan’s business. But time has proven that it is not that kind of indicator. Shopping solutions like Etsy and Shopify can provide robust online shopping experiences for customers of artisan products so selling through other outlets may not be necessary in an artisan’s mind. Superior performance (based on what I have researched on review sites, blogs, forums, and my own experience) with both “cushion” and “lubrication” better than most. Ease of lathering using water with a variety of mineral content (in other words it works well in both “soft” water and “hard” water). Good post-shave feel on the skin (not overly-drying). Available in a variety of scents (you won’t use even the best soap if you don’t care for it’s smell) or no scent at all. Artisan’s time in the market. Availability (from more than just a single artisan website. Alternates such as: Amazon, Maggard Razors, West Coast Shaving, Smallflower, Straight Razor Designs, Fendrihan, the new Shave Shack Of Texas, etc.). Remember, “Your Mileage May Vary” with these recommendations: although there is a large majority that like these soaps there will always be some for which a soap does not work as well. And an omission from this list does not mean it’s a bad product–there is lots of great stuff out there and I’m bound to forget something! This article will be updated regularly. Be sure to come back every few months. What Are The Top Ten Best Shaving Soaps? Now for the details and honorable mentions. Links may go a product choice page where you can select where to find the product: the brand’s website and alternate sources (Amazon [localized to the reader’s country when possible], West Coast Shaving, Grown Man Shave, and Phoenix Artisan Accoutrements links are affiliate). Barrister and Mann (B&M) is an artisan with an excellent reputation for product scents but I had kept them off this list for some time because their soaps didn’t perform as well as others in hard water. Their “Reserve” line of shave soaps eliminate that concern. Captain’s Choice shave soaps may be a bit weakly scented to some but no one complains about the performance! I find Captain’s Choice lather is exceptionally stable: if you’re looking for a particularly long or leisurely shave (maybe you are a beginner and taking more time as you work through the learning curve?) you will have plenty of lather to use for the entire time. Here’s Sharpologist’s review of the Bay Rum version. Catie’s Bubbles is a favorite of mine for their scent profiles: some of them seem to evoke a strong emotional reaction in me (check out my review of their “Waterlyptus” shave soap). Performance has always been really solid but I suspect they made a few tweaks recently to really get it dialed in. Catie’s Bubbles and Oleo Soapworks recently collaborated together to produce some excellent new shave soaps for West Coast Shaving. Cold River Soap Works (“CRSW”) finally makes the main list, after being on the “honorable mention” list for quite a while, after the criteria tweak. CRSW enjoys a solid reputation with the enthusiasts and both their “Select” and their “Glide” lines are stellar performers. Really the only downside is limited availability. Check out Sharpologist’s review of a Select soap. Declaration Grooming, formerly L&L Grooming, have made significant strides. I was L&L’s first “official” customer in 2016, and they had a good, solid product. Soon after, their introduction of a bison tallow shave soap base created a buzz in the shave enthusiast community. But the introduction of their “Icarus” shave soap base, with a mixture of somewhat exotic oils and tallows, could be considered almost a paradigm shift. Reviews often end up using the same word to describe the performance: amazing. The DR Harris line of shave soaps may be the last of the “old school” shaving soaps from the long-established wet shaving brands: other brands with storied histories have largely outsourced their soap-making to others, who have in-turn have modified the original soap “recipe” to the point where they no longer perform at the highest level. DR Harris shave soaps are triple-milled, tallow-based, and available in bowl, puck, or stick. There is enough scent variety to please almost everyone: Arlington is a favorite of mine, and Sharpologist has talked about Windsor before as well. Martin de Candre is insanely expensive, difficult to get, and often out of stock. But this shaving soap is at the top of many shaver’s “best” list. Originally available in only a single scent they have now branched out with some additional scents. Mike’s Natural shave soaps is another artisan who sort of “flies under the radar,” even in the enthusiast community, even though he’s been around for quite a while. But the shave soaps are the real deal: quality ingredients with a minimum of chemical extras (most use essential oils for fragrance). Many reviews mention the ease with which Mike’s soaps lather up. Phoenix Artisan Accoutrements (PAA) has a constantly changing soap inventory with a wide variety of scents that tend to be a mix of reproductions of classics and whimsical takes on culture. All of Phoenix Artisan Accoutrements’ shave soaps now use their excellent “Crown King” formulation. I think the highlight of PAA shave soaps is a really outstanding post-shave feel on the skin. PAA also blends some great shave soaps for West Coast Shaving. Wholly Kaw is another wet shaving artisan that has made an impact in the shaving soap world. Their “claim to fame” is the use of donkey milk (some use a less charitable term for donkey) in some of their shave soaps. Donkey milk contains a number of proteins, vitamins, and other ingredients friendly to the skin and often used as an alternative to Lanolin, which can be irritating to some people. Post-shave moisturization and skin feel are particularly good with these formulas. Ariana & Evans (A&E) is new to this list and becoming more widely known. Like Barrister & Mann, Catie’s Bubbles, and some others, A&E is very “fragrance-oriented.” But beyond fragrance they also have an excellent tallow, lanolin, and goat milk shaving soap base. A&E shave soaps are praised for not only their voluminous and “slick” lather but also the post-shave moisturization as well. Chiseled Face shave soaps enjoy an excellent reputation, particularly within the enthusiast community. Ghost Town Barber, their take on the ubiquitous “barbershop scent,” is a particular stand-out. Cryogen is another highlight among “menthol heads” for it’s extreme cooling (OK, freezing) properties. Dr. Jon’s started out with a fairly “average” (not that that’s a bad thing) artisan shave soap base with an interesting, if somewhat limited, range of scents. Their “version 2” soap base is markedly improved in both performance and range. Fine Accoutrements There is no denying the quality–and popularity–of their shave soaps. Initially confined to a single scent Fine Accoutrements has expanded the range to include eight additional scents. All are fairly heavily-scented so if you have a poor sense of smell like me you can still enjoy it. All use a high-quality tallow base and are triple-milled for longevity. I thought the original shave soap formulation of Henri et Victoria was good, but not great. Their recent “version 2.0” reformulation now makes the great classification for me! Even though this is “just” a vegetable/glycerin soap (and some shave nerds will poo-poo the idea that a vegetable shave soap base can perform well), both cushion and lubrication are much better compared to the previous formula base. Their tallow-based line is also really solid. No “best soap” list would be complete without mentioning Mitchell’s Wool Fat Shaving Soap (MWF). Available in a single (mild) scent, some consider it the only shave soap they will use. However, since it contains lanolin, some with sensitive skin may have trouble with this soap. 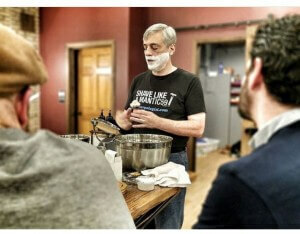 Mickey Lee Soapworks have an unusual history, even for a shaving artisan. It was started by an active-duty US Navy family. I admire them for doing what they have done on a very “shoestring” budget and the workload (and stress) that comes from being active-duty military. They may have fewer scents than others on this list and their ability to produce and distribute is hampered by their military family circumstances but their latest formulation has received excellent reviews. Noble Otter is relatively new on the scene (2017) but has quickly established itself as an artisan to watch. Their initial products were solid but there was nothing to distinguish them from other artisans also producing good products. They’ve recently improved their shave soap base (though it’s a bit finicky with the water hydration ratio) and reviews have been very enthusiastic. They may crack the main list soon. 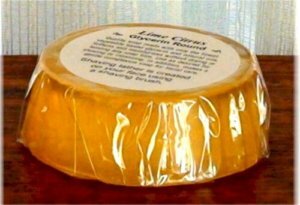 Stirling Soaps is a well-established, well-respected artisan whose products are widely available. They have a wide variety of scents (two of which, Ben Franklin and Port au Prince, were reviewed here on Sharpologist) and an active laboratory cranking out updates on a fairly regular basis. The reputation of Stirling Soap’s performance is excellent. The Holy Black has really “come up in the world” recently. Their “Creeper” shave soap has won accolades from many, and their collaboration with Caswell-Massey has given them some great exposure. There are a number of other shave soaps that I’m keeping an eye on for possible inclusion in a future update. Some are new to the market. Others have had a recent change in their business circumstances. Some have recently changed their soap formulation. And some are here simply because I don’t have enough information for a full evaluation yet. If you use a line of shaving soaps that match the criteria but aren’t listed be sure to leave a comment defending your favorite! I plan to update this post as products arrive and leave the market.